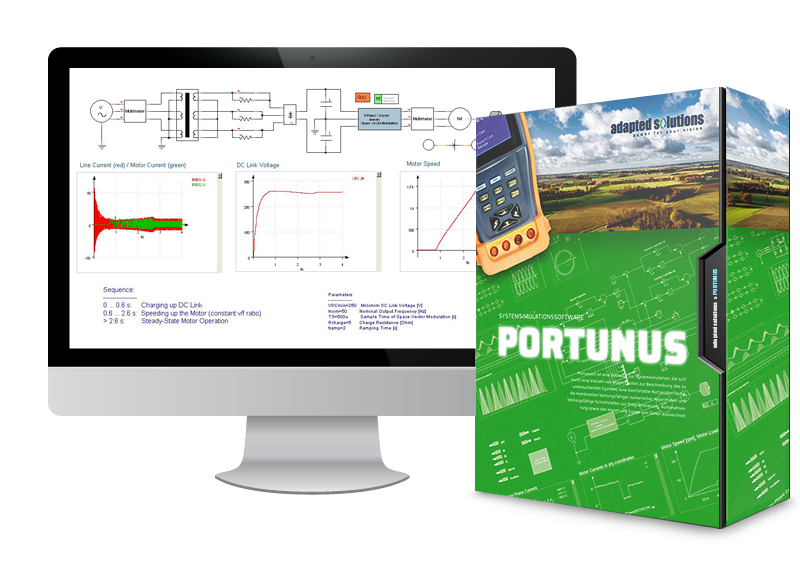 Possible applications of Portunus range from simulations of electrical and energy systems, power electronics and drives, thermal calculations, investigations of magnetic circuits up to control systems. The models and description means available in Portunus allow for easy linking of different physical domains. For example, electro-thermal simulations may be run to find out the heating of power transistors, or electro-magnetic simulations for modelling steady-state or a given load cycle of electrical machines. With the combination of electrical, magnetic and mechanical components, the interaction inside actuators may be simulated. The control algorithms used by the systems may be easily integrated into the model. When building up a system model, the ideal description approach may be chosen for every component. Quite often network models are the first choice for electrical but also thermal, magnetic and mechanical systems. Component behaviour may be described to different levels of detail. In many cases, characteristic functions or lookup tables are sufficient for the description of the static behaviour (voltage-current, speed-torque etc.). Diodes and transistors may be modelled by switch models, even by using “ideal” switches if necessary. If more detailed models are required, transient behaviour may be considered as well. A great degree of freedom comes from the opportunity to define subsystems, the input of differential equation systems with the help of VHDL-AMS or the C++ programming interface, the import of SPICE net lists or models according to the FMI Standard and the possible data exchange between the components. Block diagrams may be used if the focus is set to the signal flow. 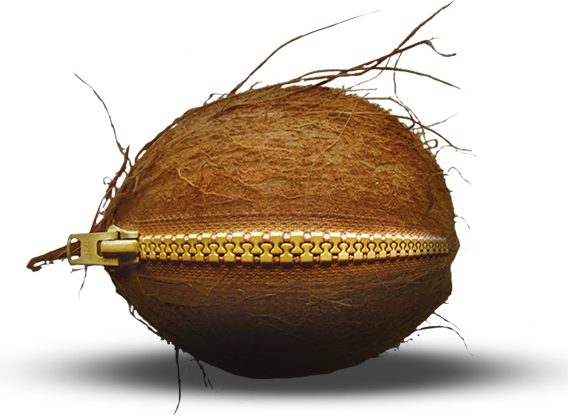 The robust numerical core of Portunus easily copes with algebraic loops. State machines allow for the clear arrangement of event-triggered systems and control. Alternatively, VHDL-AMS models may be used for the same purpose. By defining variables and using them for model parameterisation (directly or within expressions), dependencies can be displayed in a clear way and their editing becomes very simple. Portunus comes with a clear and powerful graphical user interface. Component models are placed into the schematic via drag-and-drop. The Multiple Pages Technology eases the input of big systems due to the option of splitting them into several pages. An arbitrary number of hierarchy levels may be introduced by using sub-sheets. Results can be viewed during the simulation. As many On-Sheet-Displays as necessary can be arranged in the schematic which allows for the printing of the results together with the system diagram. Very useful features of the display elements are their ability to display the results of several runs in the same diagram and to perform post-processing functions. Diagrams may be easily copied to the Windows clipboard and inserted into documents and presentations. Interactive functions and symbol animation support the understanding of the system and qualify Portunus as a teaching tool. Moreover they help to debug the model. 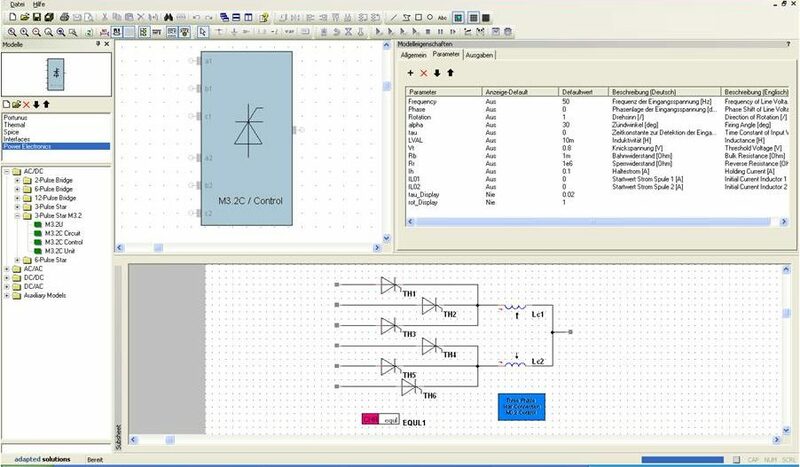 Model parameters may be altered interactively during the simulation run by means of a panel. This will for example allow for the changing of the system state or the activation of a fault via opening and closing a switch. Sliders may be used to vary different values online, for example resistances, torque or control parameters. A number of models like those for switches, diodes, transistors and states have animated symbols. The visualization of the model states (switch on/off, diode blocking/conducting etc.) during the simulation run may be activated. Debugging of simulations is supported by a replay function which shows the progress of the simulation run again without calling the simulator. Users of Portunus may create and edit their own model libraries. Models stored in a library can be defined by subsheets, the creation or import of VHDL-AMS models and SPICE net lists or by programming with the C++ interface. Subsheets can be inserted into libraries conveniently via the clipboard. The library management functions include the definition of model symbols. 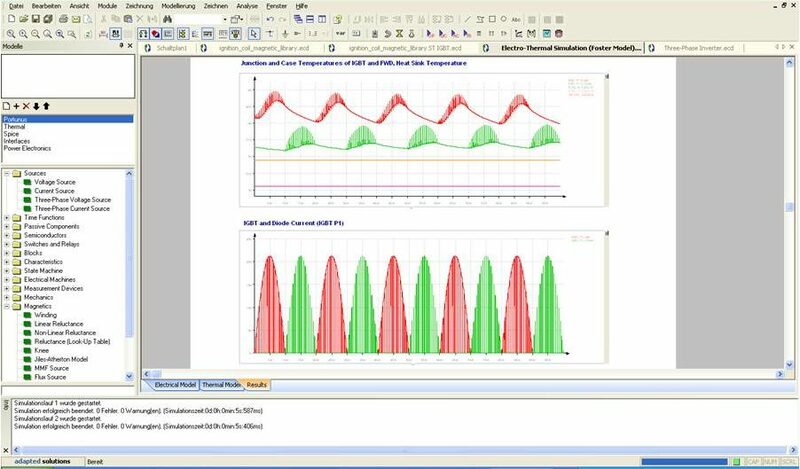 The graphical user interface of Portunus offers more useful functions like a panel for the definition of multi-simulations, sending emails, direct data export to Excel®, Origin® and Matlab® and an editor that supports the input of mathematical expressions. The simulator kernel of Portunus may handle algebro-differential equation sets (analogue systems) as well as event-triggered systems (digital systems). 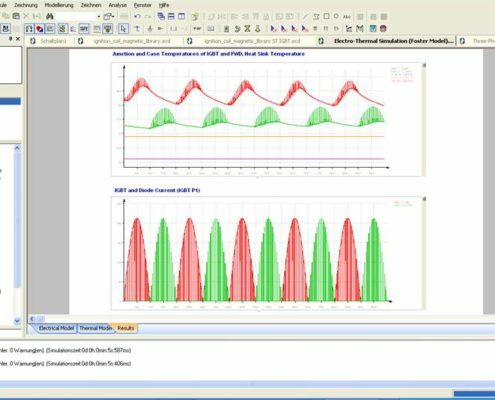 Analyses can be performed in the time and frequency domain (transient and AC simulation) as well as for steady-state (DC calculation) and operating point (OP). 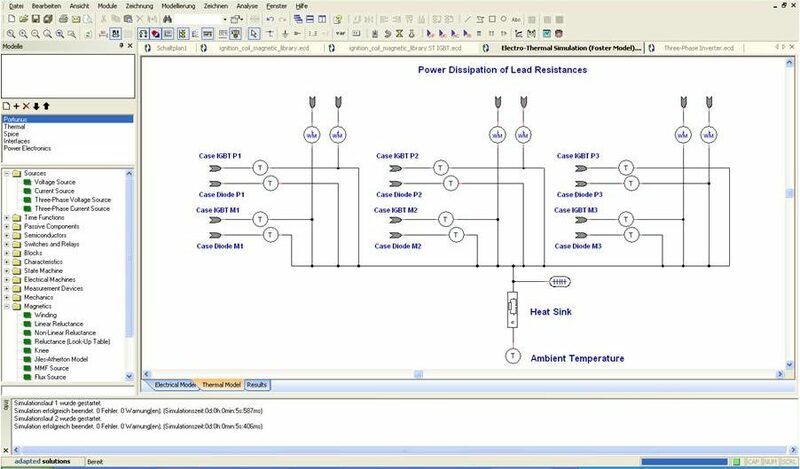 DC or OP calculation may be set to run prior to a transient simulation in order to save the time for the calculation of the initial transients. All analyses may be superimposed by a multi-simulation to investigate the effect of parameter variations. 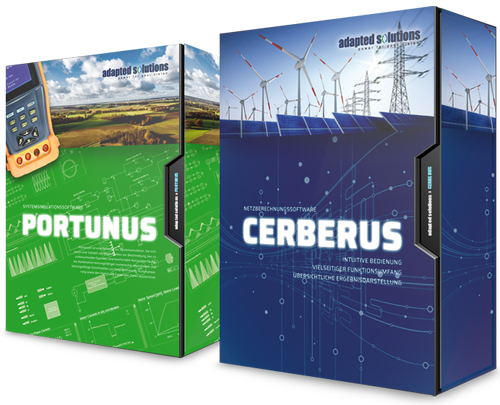 The standard libraries provided with Portunus contain more than 100 models for the simulation of electrical, mechanical and magnetic systems, blocks and SPICE models. The Thermal Library, containing detailed models for thermal simulations, is offered as an add-on feature. Main components of this library are models for the calculation of the heat flow by thermal conduction, convection and radiation. The input dialogues of these components let the user select between “geometric building blocks” (flat plate, cylinder, heat sink etc.) which are the base of the non-linear heat-flow equations. In conjunction with the definition of variables, it is possible to enter the geometry of the system to be investigated just once. The same geometry parameters may be used for the parameterisation of several heat flow models. In addition, the input dialogs contain tables with properties (density, thermal capacity, thermal conductance) of several materials. In addition to the heat flow models, the Thermal Library contains temperature and heat sources, RC networks (Cauer and Foster type), thermal capacitances, measurement devices and models for the coupling of electrical and thermal networks. 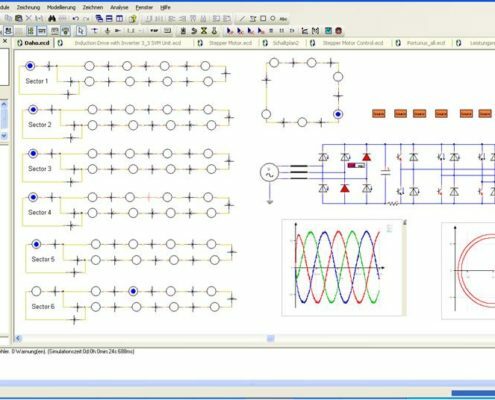 Another add-on – the Power Electronics Library – contains about 90 models for the simulation of power electronic systems, from two-pulse rectifiers up to three-level inverters controlled by space vector modulation. With the separation into topologies and control algorithm, the user may replace single modules by his own work. 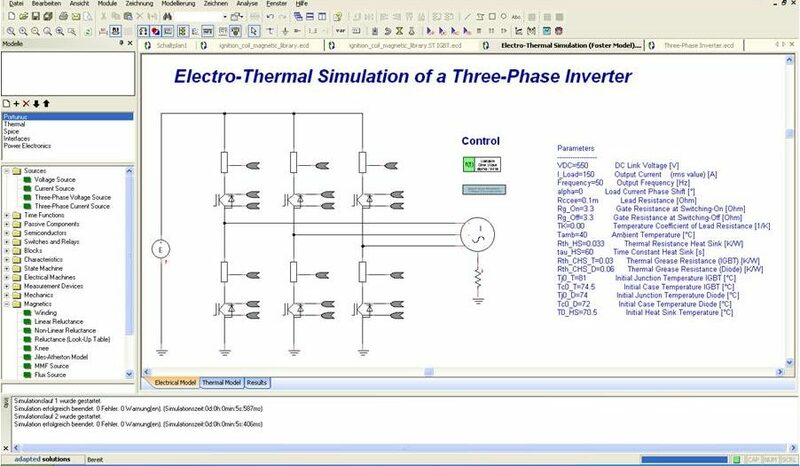 A particularly powerful model is that of an IGBT with free-wheeling diode for electro-thermal simulations. It is based on a special modelling approach (average model) which enables quick temperature calculations of the semiconductors. 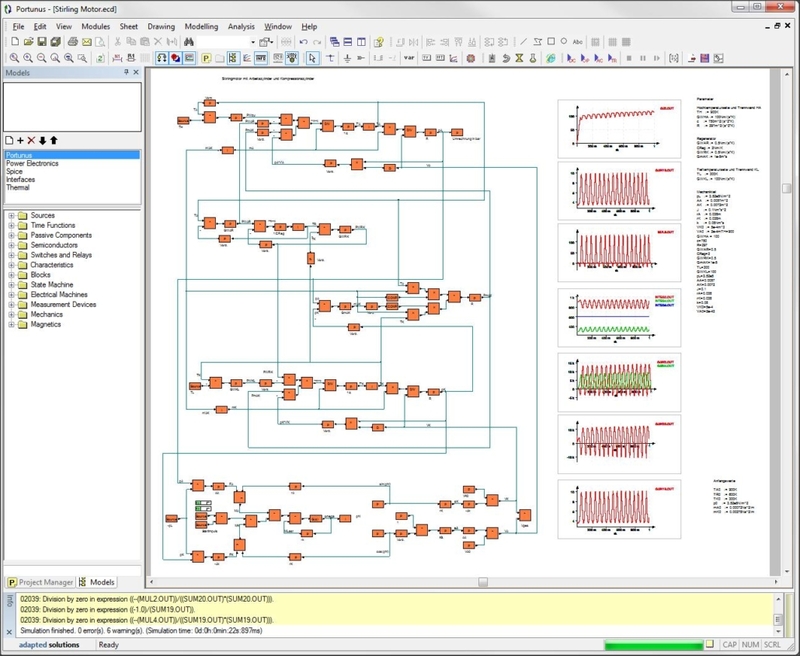 About 150 parameter sets for Infineon modules are integrated in this model. Modelling of common drive control structures is supported by special models for coordinate transformation (Clarke, Park), voltage-frequency control and sine wave sources of variable frequency. data exchange with other applications, e.g. to couple simulators or to access databases, has to be realized. User-defined models are stored in a DLL and loaded at the beginning of the simulation. The automation interfaces (OLE, http) of Portunus allow for the call of Portunus via scripts and therefore the integration into a design flow or a web-based simulation. In order to reduce calculation time, Portunus may be run in “hidden mode”. 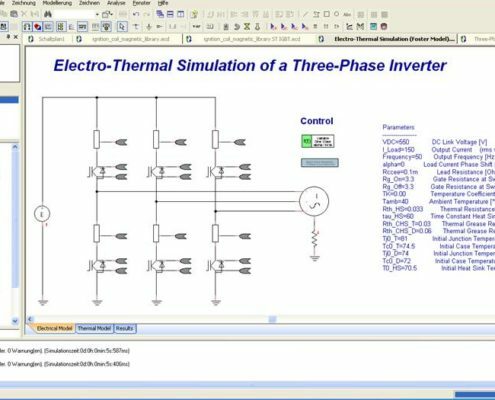 The automation interfaces provide functions for loading and saving schematics, reading and setting parameters, starting simulations and accessing simulation results. A number interfaces for simulator coupling and data import / export are integrated into Portunus. 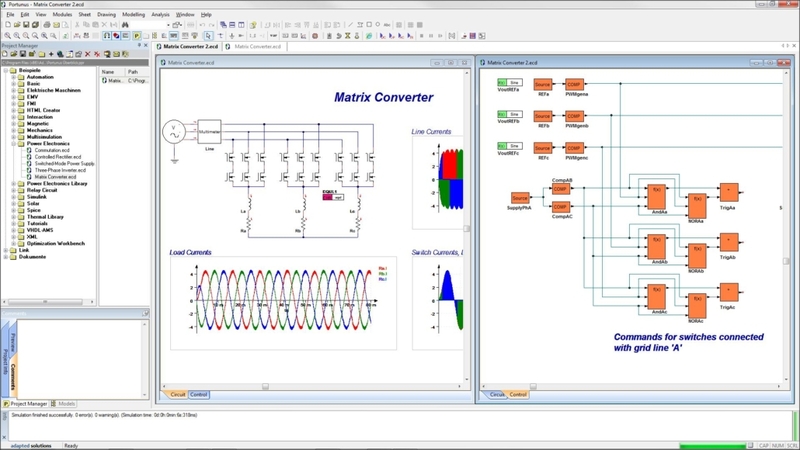 Coupled simulations with Matlab®/Simulink® are possible due to a very effective software interface which features simple handling and great flexibility. 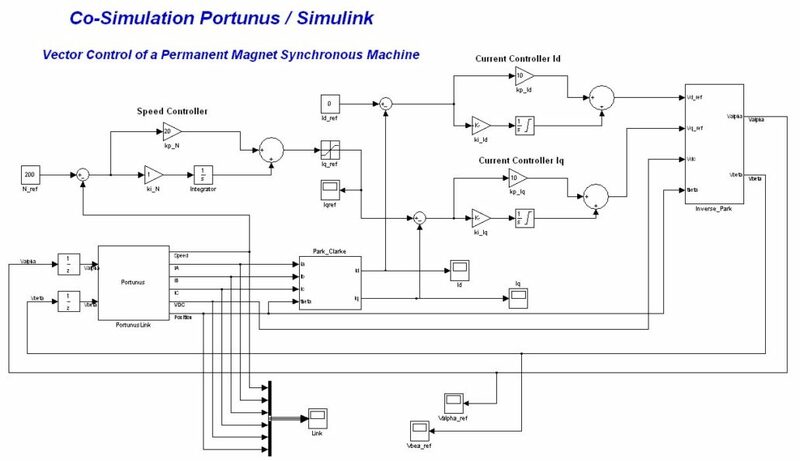 Unlike common simulator couplings, the Simulink® interface of Portunus realizes the communication between the two programs by using functions of the graphical user interfaces only. 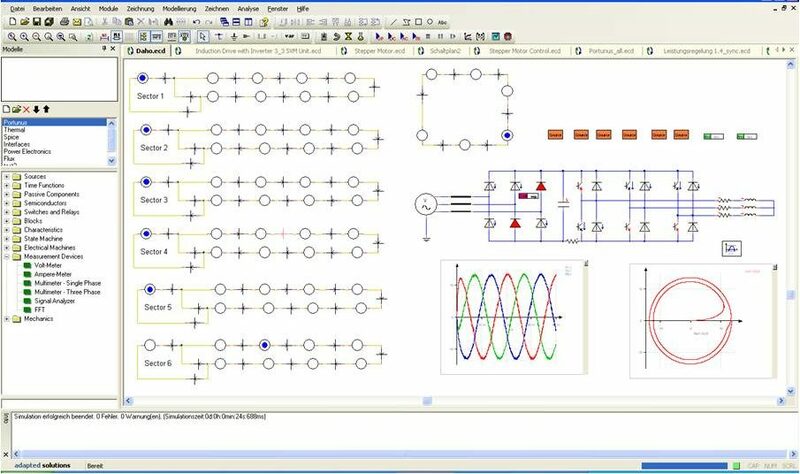 This makes it possible to visualize changes in the data exchange defined in the Portunus model immediately in Simulink®. Coupled simulation may be started in Portunus as well as in Simulink® by a single mouse-click, or automatically by scripts, or via the parameter variation in Portunus (multi-simulation). Portunus has built-in interfaces to the software EasiMotor by EASITECH, both for data import (motor parameters) and coupled simulations. 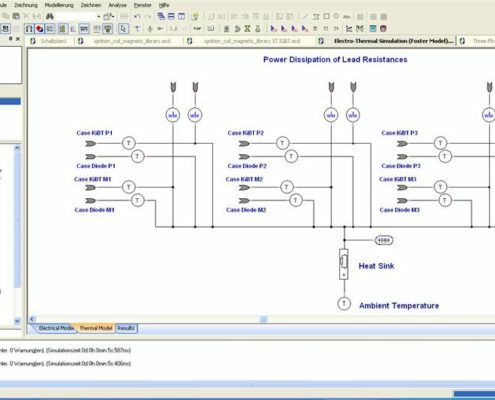 Thermal networks coming from the software Motor-CAD® can seamlessly imported into the schematic editor of Portunus. Import of XML net lists according to Portunus specification. Portunus as Master, Modes “Co-Simulation” and “Model Exchange” (restricted to “analogue systems”).